Would you describe yourself as an active concertgoer? If you find yourself seeing lots of live music, you may have noticed that many bands are sounding remarkably close to their produced recorded material. The vocals sound big, clean, and expertly performed in perfect pitch. Even the backing vocal harmonies are on point. You may think to yourself, “Hmmm…that’s interesting. I hear a keyboard part. I don’t see a keyboardist. Is that a violin I hear? Where is that electronic drum loop coming from? The drummer appears to have a normal drum kit.” It dawns on you perhaps there is more going on behind the curtain. That hypothetical anecdote might come off as antiquated if you are a modern musician with any technical savvy. To you, it may be obvious and par for the course that bands these days play to backing tracks. It’s important to explain exactly what backing tracks mean because there are many, many shades and degrees to which a band can add automation and backing tracks. This is when there is no live performance of any musical instruments or vocals at all. The artist(s) are mock performing to a pre-recorded track, also known as lip-synching. This was popularized in the 1960’s on television programs like American Bandstand and is utilized more so in the Pop world where there are elaborate dance routines, which make live singing difficult. This method is often used on television, and live telecasts specifically because it mitigates potential live sound production problems, which can occur due to countless variables. This is a very famous Michael Jackson performance at the Motown 25th Anniversary show in 1983 where he introduced the Moonwalk. It is 100% in the can, and still shook the world. This is where things start to get more complex. Since, either the band or vocalist is on track and the other is live, the drummer has to have a signal fed into their headphone mix with a click (tempo) track and any other pertinent live or pre-recorded audio tracks. Another signal is then sent to the Front of House Sound Engineer containing the pre-recorded tracks. This can be accomplished with something as simple as an iPod or more complex setups using a computer running a program like Pro Tools, Mainstage, or Ableton Live through a mixer and even possibly an in-ear monitoring system. These programs can also sync up with midi programming that can control amp/effect switching, light shows, and other elements in real time. I would be lying if I said I knew all of the technical ins and outs of running tracks live. These are very basic broad strokes, and I don’t want to speak beyond my knowledge. Usually, it’s a television performance when the band is on track and the vocals are live; Again, this is to avoid technical issues. Conversely, when there is a rigorous dance routine, a live telecast, the vocalist is ill or just not a strong performer, the band will play live and the vocals are on track. It is also very common in Hip Hop that a vocalist will rap to a track usually provided by a DJ or even someone just running a laptop or iPod. I am not a big fan of this method as it’s tantamount to a propped up Karaoke show, and does not pack the punch of a live band. Although, I do understand that hiring bands are expensive, and frugal touring is essential to survival. Big name acts like Jay-Z and Kanye West regularly utilize live bands to effectively elevate their live shows to the arena status they have achieved. This is a Pharrell performance from the NBA All Star Weekend 2014 with tracked band and live vocals. 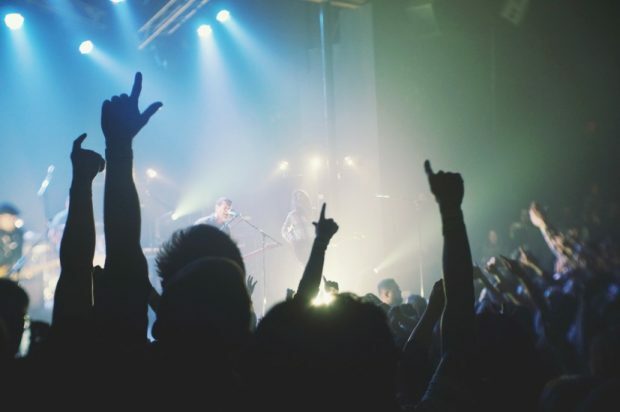 This is the most common formula for most modern touring live bands in all genres from Rock to Pop to Country to Metal. It is so common now, that it mostly goes unnoticed and is considered part of live performance. The reasoning is pragmatic in that most bands incorporate programmed keyboard parts or electronic drum loops into their albums, and cannot afford to bring a live keyboardist or sampler. This is understandable, but it is a slippery slope as any instrumentalist can be replaced by a track if need. Progressive instrumental band, Animals as Leaders, have no bass player in the band, but run bass tracks live. Technical Deathcore band, Born of Osiris, lost 1 of 2 guitarists a couple years ago, but still use secondary guitar tracks live to keep the sound filled out. This is in no way meant to call out or chastise these bands. I am just using examples of how this technology is expanding the options. In addition to keyboards and orchestral instrumentation that are impractical to tour with, the main usage of backing tracks is to either beef up live vocals or to add vocal harmonies in situation where the band either lacks enough or any backing singers at all. For example, Swedish Melodic Death Metal band, In Flames, has no members that sing live backing vocals and they have heavy synth and electronic elements on their recorded material, but no live keyboardist. They were one of the first bands I’ve ever seen that used backing tracks live. As far as I am concerned though, In Flames are the poster child for how live backing tracks are supposed to be used. The tracks are a product of lush and stylized album productions. In Flames happen to be an elite set of musicians. The tracks are not a crutch. They just add contour and grandiosity to an already great band. I know this for a fact because my old band played a Spanish festival called Kobetasonik with them in 2009. Their tracking equipment was lost at the airport, and they played a dry set. They sounded just as good without the tracks: just a bit more bare. This is relatively self-explanatory. A live band playing and singing every sound heard in the moment, with their organic faculties, was the one and only way to do a live show for centuries. But, 100% live bands are becoming more and more the exception than the rule. Many bands have their drummers play to a click track to keep the tempo steady, even if there are no backing tracks. Old-school purists feel that even running a click track takes away from the human quality and natural sway and pulse of the music. As far as heavy music, I look at bands like Machine Head, Killswitch Engage, or Metallica who play without any aid of backing tracks at all with the exception of a few intros. These bands are clearly in the 1% of the 1% in terms of stature and ability. It’s much easier said than done to just tell bands to just play great, especially in this age, where a bad performance can be filmed on a cell phone and broadcast on Youtube for all to see. As pointed out by Malcolm Gladwell’s study of success, Outliers, when you are born and more specifically, the era in which you ascend into prominence in your field of pursuit has vast impact on whether or not you will succeed. I’m not sure if it’s good luck or bad luck, but I got my start in the music industry with my band God Forbid in the mid 90’s. What made this era so distinctive was that it marked a turning of the tide with one foot in the analog world, and next making a big jump into the digital age. God Forbid never used a live click or any tracks until 2012, almost 14 years into the band’s existence. It helped keep the band tight as the tempo had a tendency to get speedy on the some shows, and backing tracks were very minimal: a keyboard part here or there, and some vocals in a couple songs to help solidify some of the bigger melodic sections. But the parts were tucked in, barely noticeable if you weren’t paying very close attention. We still did 80-90% of the set with no tracks. This live version of “Equilibrium” has those most backing tracks of any song we were doing, and you can barely hear anything. You can hear when the vocals are out of pitch. Transparently, it’s not in the can. Since leaving God Forbid in 2013, the 4 or 5 bands I’ve played with have all used backing tracks to varying degrees of effectiveness, and I’ve been able to see how different people address this technology on a philosophical level. When it comes to making a judgment call on whether tracks are a good or bad thing, the jury is still out. My philosophy on the matter is that good backing tracks should be like a great special effect in a movie; the best ones are the ones you don’t even notice. I found this video of Canadian thrashers, The Agonist. The tracks are running some vocal harmonies in the chorus that are overly loud, and obvious. This mix may be just for video or a direct board mix, and may not represent how it actually sounded in the room. But if it did, than that is a miscalculation by the sound engineer in my opinion. The lead vocalist can clearly sing just fine. The tracks are not being used to mask her ability, but mainly to get the live show closer to the album sound. Again, I must implore that I am not singling out The Agonist in a negative way. They are a very good band, but I am just using them as an example of when these tactics can be suboptimal. There are also cases of bands that use a mirror track for the lead vocal so you have the live vocal run parallel to a pre-recorded track. This can sound good, but almost too good. I am not sure where I stand on this approach, and will not post any examples because I am not sure if its fair to call bands out on this. In many cases, I am not sure where it’s being used, but I can say that it is becoming very common. Bands tour with others bands that do it, and they copy them to keep up with the Jonses. It’s like steroids in sports. People use them because they feel like they can’t compete otherwise, and I sympathize with that. I have also seen this method used with bands adding extra guitars to beef up the tone. In my view, all of this stems from overproduction on modern records. It is so easy to throw midi sounds and electronic elements directly into Pro Tools, Logic, and even Garageband sessions. You can add unlimited layers of guitars and pianos and whatever else you can conceive. You are often recording at home, at your leisure: no studio time or 2 inch tape to pay for. Vocals are doubled or quadrupled with several harmonies added, and then auto-tuned. We have painted ourselves into a corner. It’s the equivalent of having Photoshopped and airbrushed photos on a dating site hiding all of your physical flaws. You don’t look like that, but what happens when you actually show up on the date? That date is the live show. You don’t really sound like that album either. If you want to avoid using backing tracks live, your best bet is to create more stripped down recordings: less layers, avoid doing vocal harmonies or guitar parts you don’t have members to perform, and use auto-tune sparingly. This is almost impossible to do because modern producers also have Jonses to keep up with as well. They are afraid of putting out albums that aren’t flawless because it may come off as unprofessional. I can sympathize with that as well. Listeners have come to expect perfect performances. This is the “modern” sound. This may make me sound old, but bands like Pearl Jam and Rage Against the Machine can sound so great live because their albums capture essentially what the bands sound like as a live act. Look at these performances from VERY early in their careers, before their seminal albums were recorded. If you want to embrace technology and backing tracks, that’s fine, especially if your music is more electronic in nature and has very little organic instrumentation. I just think that things can become unhinged in that we don’t know what we are seeing is truly live anymore. Most of the public probably does not care. EDM and DJ’s are drawing tens of thousands to festivals and those guys might just be pressing a space bar. I don’t know. As someone who is in awe of brilliant musicians and performers, I don’t want to lose that awe because I’m not sure if what I am seeing or hearing is real. As Morpheus in the Matrix once asked,” What is real?” I guess that question is for all of us to ask ourselves. Ex God Forbid guitar player. Songwriter. Blogger. Know-It-All. Non-conformist. NY Knicks fan. Coffee enthusiast. Agnostic.